I knew it would happen, but it has been a long time coming! The City of Vancouver finally has real food scraps pick up! Back in 2010, the City started picking up fruit and veggie trimmings. It was a great step, but something that was a) already easily served by our backyard compost bin and b) not made available to the apartment dwellers who don’t have backyards to compost in in the first place. 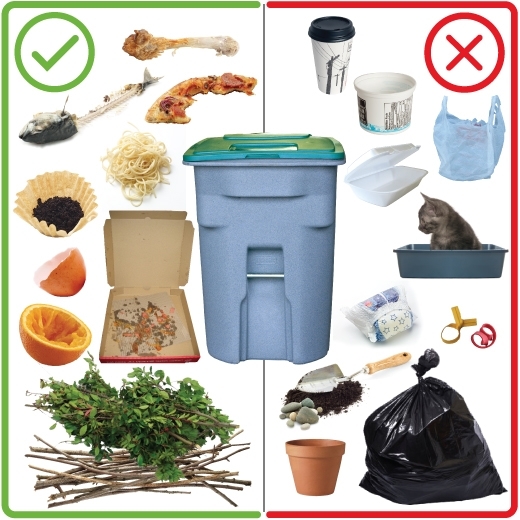 So this newly announced expansion means that meat, bones, dairy, cooked food, bread, pizza boxes, and paper napkins are allowed in the yard waste cart headed for composting. And better yet, the City doesn’t allow plastic bags of any kind (even the ones stamped biodegradable). They’re pushing you to line your kitchen bin with newspaper instead. Of course, if we were all managing our food properly, we wouldn’t have much waste to compost, but it’s great to have an alternative for your fat trimmings and bones and the occasional fuzzy mystery at the back of the fridge. More details are on the City website. Next up? Weekly compost pick up and biweekly garbage. Could you do it? Those of you living in Canada should come down and teach a few things to us in the US. We finally have a single stream recycling program, but most people don’t compost and there is no composting for food here by the municipalities. What gets to me the most is the instruction to bag up lawn clippings and fallen leaves to dispose of. Leaves are great for covering flower and vegetable beds to winter over. If you don’t have a garden, you could still cut them up with the mower and leave them on the lawns for added nutrients. I’m a former-Vancouverite living in Portland, OR. Here we have weekly curbside compost pick-up that includes all of the items that Vancouver allows, as well as weekly recycling and, bi-weekly garbage pick-up. We also pay for garbage collection by size of container and we have a (lower-cost) option of monthly garbage pick-up – or no garbage pick-up. So there are progressive policies in place in US municipalities, maybe it’s worth letting your local council members know about it!